Home » Retention Ponds » What are retention ponds and detention ponds? Retention ponds are basins constructed for holding water. Typically this is water that is runoff from higher elevation. Often they are built near areas of development such as larger buildings or parking lots. You’ve probably seen retention ponds without knowing what their real purpose is. They can be found near places like a Walmart or Menards. Think of somewhere with a huge parking lot – if it was built recently, laws probably required that the owners install a retention pond. 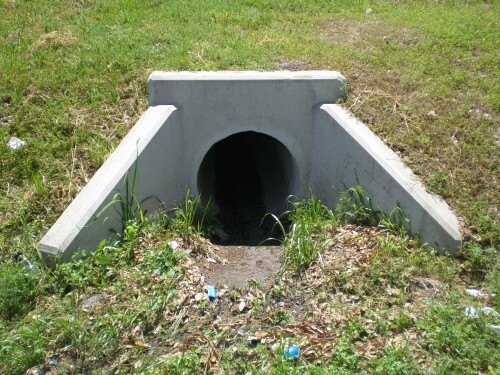 They can also be found near some residential areas (at least ones built after the mid-1980s). 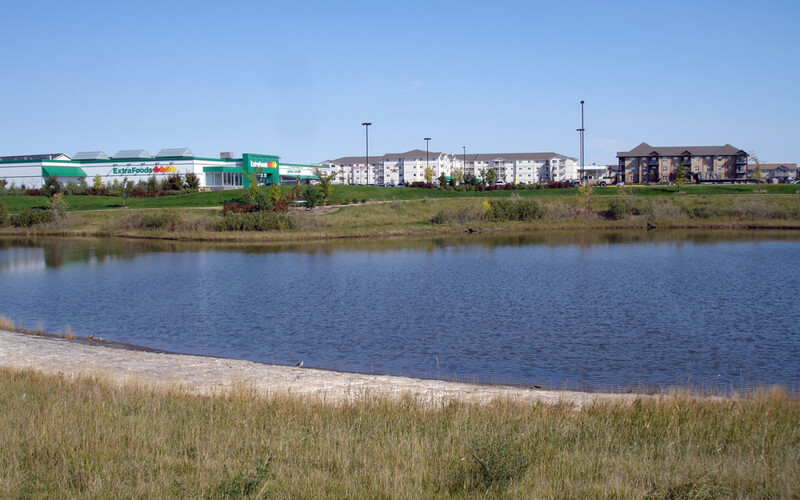 Retention ponds are built to control water runoff and to help limit flooding. The reason they’re needed near parking lots, buildings and the like is because of the huge square footage of surface area for water to hit and run off of. If it was open land, the water would be allowed to either seep into the water table or run into a nearby stream, river or other tributary. 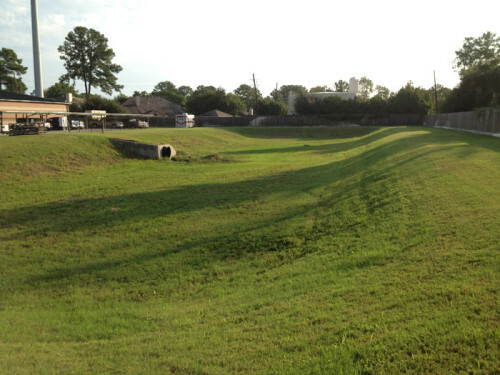 Think about it – without a retention pond, where would the water go? It would likely pour into local sewer systems, potentially filling them up and overflowing them. Instead of flooding, the water can flow into the lower elevation retention pond. Retention ponds are just one type of water retention basin. They are named so because they retain water, or at least they typically hold water in them. They usually also have an overflow pipe so that the water level doesn’t get too high. Retention ponds are usually shallow with slow, sloping sides. There’s also typically a fair amount of land around the ponds than can handle more high water periods. The sloping sides and land is also for safety. Since retention/detention ponds are built in public areas, they’re made in a way that people can get out of easily if they accidentally fell into them. A lot of times retention and detention ponds are built near each other. The detention pond will hold the water up first and help prevent flooding. Water will then slowly drain out into the retention pond where it is held. These ponds also can assist with pollution removal. During periods of heavy rain, the ponds slow water movement. As the water becomes stagnant, the heavier solids and metals sink to the bottom. The clean water can drain out into nearby fields or steams. While detention/retention ponds can clean outgoing water, the water in them isn’t always the safest, especially when they’re in a residential area. They are not recommended for swimming because of the contaminants that fall to the pond floor. This is another reason that retention ponds are good candidates for our sediment removal services. We are 100% environmentally certified and can take care of the potentially hazardous sediment. We are HAZWOPER certified (Hazardous Waste Operations and Emergency Response Standard), which is an OSHA set of environmental guidelines. In some cases we also work with the EPA to make certain that all environmental protocols are followed. A discharge drain from a detention pond into a retention pond. Just like most ponds, retention and detention ponds can have many issues such are low aeration, lots of algae, high bacteria count and more. Oxygen is essential to these ponds, and we recommend some form of surface aeration. However, sometimes sediment needs to be removed from these ponds to prevent a real problem. Retention ponds are very useful and they’re everywhere. Keep an open eye the next time you drive around your local mall or shopping center and you’re likely to spot one. And of course if you have questions about your residential or commercial retention pond, we’re here to help! We have cleaned up ponds of all sizes.